Life Limiting Conditions (LLC) are conditions for which there is no reasonable hope of cure and from which children or young people will die and include life-threatening conditions for which curative treatment may be feasible but can fail. Together for short lives recognises that four broad categories of life-threatening and life-limiting conditions may be delineated. Categorisation is important for the purpose of planning and needs assessment. 3 Progressive conditions without curative treatment options Treatment is exclusively palliative and may commonly extend over many years. Despite falling mortality rates, the number of children living with LLCs is rising; this reflects general advances in medical care and preventative measures. There are in excess of 49,000 children and young people under 19 years in the UK living with a life-limiting or life-threatening condition that may require palliative care services. These conditions consist of an extremely diverse array of conditions (over 300) however up to 15% of patients requiring palliative care do not have a definitive underlying diagnosis2. Children requiring palliative care services may have widely varying needs, as many have severe disabilities and multiple complex health and care needs. A child’s condition may lead to a palliative care approach being used exclusively or used in conjunction with curative treatments. 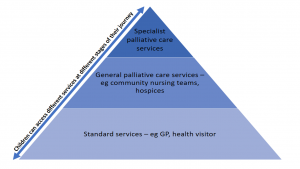 Palliative care services may be required at any point. They may start antenatally and continue beyond a child’s 18th birthday. Services may potentially be required from diagnosis or recognition, through active treatment, including that aimed at cure, to end of life care and bereavement4. Children’s palliative care is delivered by a multitude of different providers, including primary, secondary and tertiary services, community services and hospices. All paediatric specialities may encounter children with palliative care needs whether an acute speciality or community. 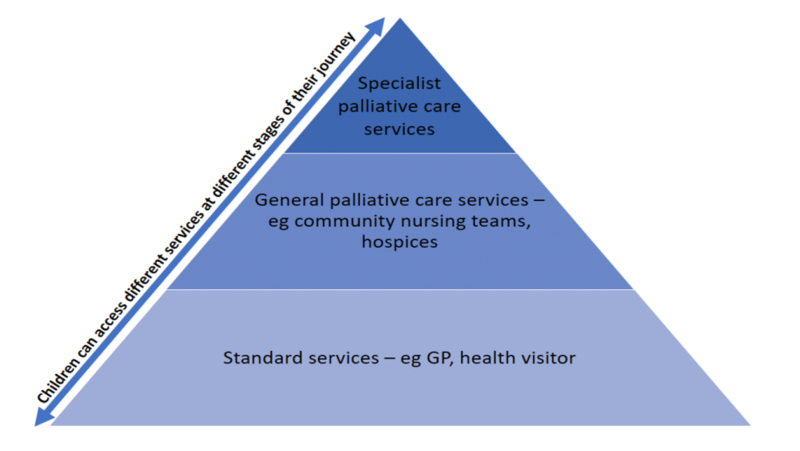 Effective networking arrangements between services, with good communication and care coordination is essential for successful paediatric palliative and end of life care. Currently a large proportion of children die in hospital especially intensive care. Furthermore, due to lack of advanced planning, local services and skills a significant proportion of children with life limiting conditions invariably experience frequent, often prolonged hospital stays, usually within the paediatric unit or intensive care setting; effective palliative care services can help reduce this. A child’s physical symptoms can be managed in different ways as highlighted in the infographic below, however there are common goals that need to be followed independent of the approach. Looking after a child with palliative care needs may appear daunting and is likely to install an element of anxiety in the unexperienced doctor. However, remembering basic skills and following a logical approach goes a long way. It must also be remembered that there is much more to treating the terminally ill child than just symptom control; such as the emotional, social and spiritual needs of the child and those close to them. The parents play a pivotal role in symptom control as they usually have the best understanding of the childs’s medical, nursing and social needs. It is vitally important that parents are involved in decision making and parents must feel that they have informed choice in the care of their dying child. This is very important in post bereavement support6. It is beyond the remit of this article to discuss symptom management in detail however an excellent resource to utilise is the Basic Symptom Control in Paediatric Palliative Care document available from the together for short lives website –http://www.togetherforshortlives.org.uk/professionals/resources/request/2434 . 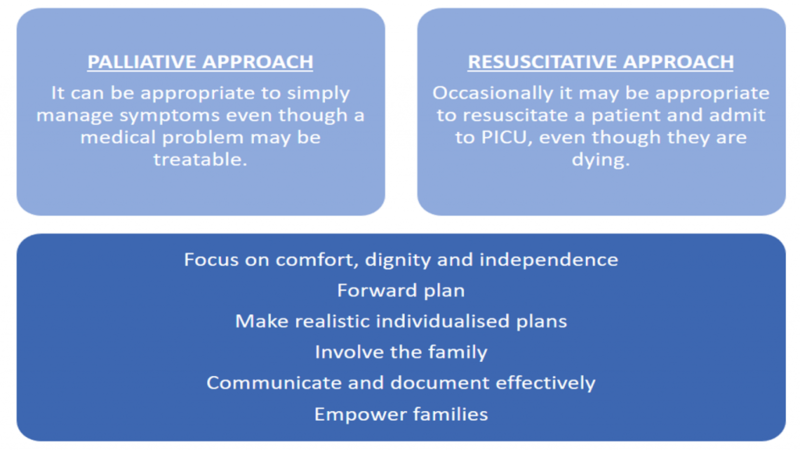 Advance care planning and clarity about resuscitation decisions are essential for effective quality palliative care. It involves discussions between the patient (where possible) and their care provider and often those close to them. Advance Care Planning helps create advance statements about wishes and preferences such as preferred place of care, withdrawal of treatment and resuscitation status. It also helps in in decisions relating to care in the case of acute deterioration and may also address preferences for organ and tissue donation. Children, young people and their families should be fully involved in decisions regarding their treatment including the difficult and emotive subject of withholding or withdrawing of life saving treatment. Their decisions should be recorded, visible and clear for all those involved in that patients care. Do Not Attempt Resuscitation forms have been in existence for many years however there has been lots of controversy and misunderstanding over their design, use and limitations. In the era of increasing availability of children’s palliative care services and other support services the need for individualised recommendations for a person’s clinical care in emergency situations, including cardiorespiratory arrest is increasing. The ReSPECT (Recommended Summary Plan for Emergency Care and Treatment) process supports the creation of these recommendations by initiating conversations to ensure a shared understanding of the condition, current issues and future outlook. The child’s/families preferences for care and realistic future emergency treatment are then explored. The process is finalised by making and recording agreed clinical recommendations for the child’s care and treatment for future emergencies or deterioration7. These recommendations can be used by all practitioners involved in the patients care, whether in the home, community or hospital. Most ethical issues relate to end-of-life care and decision-making. The child’s inability to act autonomously and subsequent reliance on their parents often complicates resolving these dilemmas8. Paediatric palliative care comprises a comprehensive approach to treating the physical, psychosocial and spiritual needs of patients facing life-limiting illnesses and their families and requires the coordinated efforts of a large multidisciplinary team. This rapidly advancing speciality with ever increasing evidence base enters into all paediatric specialties and should be considered alongside active treatment for all children with life limiting or life threatening illnesses. What category of palliative care does cystic fibrosis fall into? Which of the following is not a difference between child and adult palliative care? What enhances advanced care planning? Which of the following is NOT one of the four ethical principles?